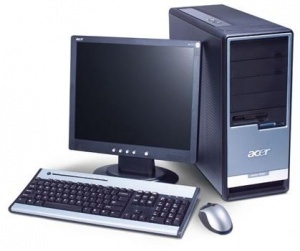 A personal computer (PC) is a general-purpose machine which serves a purpose of operating software designed to make day-to-day living easier to manage, by way of producing spreadsheets, artwork, word processing, and much more. PCs are generally considered the strongest gaming machine available if created as such, as their design allows for them to be upgraded piece by piece, with technology fresh out in the market. The earliest widely-known PC's manufactured by IBM ran the MS-DOS operating system, with Windows surpassing it later on. Other PC's include the line of Apple's Macintosh computers as well as Linux. Due to the extensive nature of a PC, being the machine used to develop games in the first place, and its open software, it is considered to be both the hardest and easiest system to rip content from depending on how each game's content is formatted. As you can imagine, ripping from a PC game is very much on a case-by-case basis. The best options you have for ripping content is by using any of our list of universal ripping applications. In the case of 16-bit Windows games (which are incompatible on modern hardware without the use of virtual machines), Borland's Resource Workshop can extract image files directly form the .EXE and export them. The program is incompatible with DOS games and games designed for 32-bit Windows systems and above, though there are alternatives for modern operating systems, such as Resource Hacker. Bar none the best emulator for running games designed for MS-DOS. While it lacks features commonplace in emulators for home console games such as save states, it has an instant screenshot function accessed through the key command Ctrl+F5 as well as speed control through the use of rising and lowering the cycle count with Ctrl+F11 and Ctrl+F12. While it requires some setup work, Mini vMac is a powerful emulator for Classic Mac OS. Unlike DOSBox, it lacks a quick screenshot feature and no speed control functionality, thus the computer's Printscreen key or snapshot functionality must be used.